This Presidents report will touch on the very enjoyable and successful North Queensland Expedition (a report covering this is in this newsletter), the work in the nursery at Olinda, the continuing role of the society in the Gardens at Olinda and questions where to for our branch of the ARS. September saw a group of ARS members involved in an expedition to North Queensland to observe the Rhododendrons lochiae and viriosum in their native habitat. The expedition members included two from Adelaide (Rob and Jackie Hatcher), Ian Chalk from Emu Valley Gardens in Tasmania and six ARSV members. The Victorian members being Simon and Marcia Begg, Prue Crome, Dan MacLeod, Andrew Rouse and myself. Not every member got to the location of every Rhododendron population, but overall the expedition examined four mountain top populations and it would have to be deemed a huge success. I’ll leave you to read the expedition report and look at the photos in this newsletter and let you decide if you agree. The expedition proved to be an enormously enjoyable activity for the participants. It is a great joy travelling with people who share the same interests. 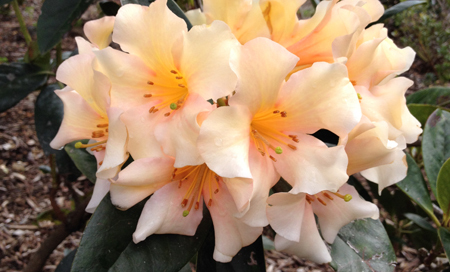 The members had an interest in plants in general not just Rhododendrons. How else could you convince others to join you on a drive that took all afternoon just to look at a wattle which grows only 150mm high and has purple flowers (Acacia purpureapetala at Irvinebank) or trek through leach infested rainforest just to see some rare tall trees (Stockwellia quadrifida) and still think you had had a good day.